IllumiNITE is a company for “today’s outdoor enthusiast who doesn’t stop when the sun goes down.” IllumiNITE offers “head-to-toe reflectivity” in the form of clothing items that use patented techniques wherein microscopic retro-reflective sataLITE™ DISHES reflect light back to its originating source. You can also buy shirts, jackets, pants, and accessories with the IllumiNITE-patented technology. If online shopping isn’t your thing, you can find a vendor near you. 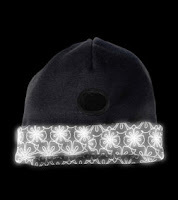 The hat that I’m giving away today (pictured) is my favorite winter hat. It’s very warm, simply stylish, and the ponytail feature is fantastic. WIN IT! 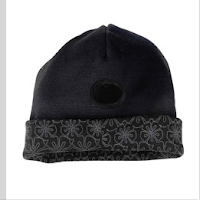 One mama will win an Ebony Dryrite Toque (pictured). To enter, simply leave a comment and your e-mail address on this post prior to Thursday, Feb. 21. Remember, you must either post the Get Fit in February button on your blog or e-mail 5 of your friends about the promotion to be eligible! The winner will be announced and contacted on Friday, Feb. 22. * Winner must provide a U.S. mailing address. * UPDATE * The winner is #17 PS. Congratulations! VERY COOL…FUN HAT! wOULD BE GREAT AT NIGHT! Nice hat!Posted the get fit button to my blog http://sunchicka.livejournal.com/904.html. Very cool hat! I would love to win! this is awesome! please enter me. fantastic hat – would absolutely love it! Thanks for the give-away, will tell my friends! This is a great idea! The orange camo just does nothing for me. I’ve got your button. Wow! While I’m not a runner, I do walk the dog every day and in winter those nightly walks can be kind of tricky. This is awesome! Very, very cool! I walk to school in the mornings (I’m a teacher) and this would be great for safety! That’s great! I’m usually running at dusk in the fall and winter. This is a lot cuter than the blinking arm band I wear! This would be great on those cold days I run!! Thanks!! Love the hat, very cool! This looks neat just to wear around. I’m not a big fan of running in the dark, but when I’m hanging out with friends, this would look awesome! Very cool. I would love a toddler sized one for my daughter, too! This is one cute hat! The way it lights up is fantastic. Please enter me another of your generous giveaway drawings. All is appreciated…..
Now that’s a cute hat! See the World, One City at a Time. Metropolitan Mama is a participant in the Amazon Services LLC Associates Program, an affiliate advertising program designed to provide a means to earn fees by linking to Amazon.com and affiliated sites.